Google Stackdriver Monitoring allows users to create charts and alerts on monitoring metrics gathered across their Google Cloud Platform (GCP) and Amazon Web Services environments. Stackdriver users who want to drill deeper into their monitoring data can use Cloud Datalab, an easy-to-use tool for large-scale data exploration, analysis and visualization. Based on Jupyter (formerly IPython), Cloud Datalab allows you access to a thriving ecosystem, including Google BigQuery and Google Cloud Storage, plus many statistics and machine learning packages, including TensorFlow. We include notebooks of detailed tutorials to help you get started with your Stackdriver data, and the vibrant Jupyter community is a great source for more published notebooks and tips. Libraries from the Jupyter community open up a variety of visualization options. For example, a heatmap is a compact representation of data, often used to visually highlight patterns. With a few lines of code included in the sample notebook, Getting Started.ipynb, we can visualize utilization across different instances to look for opportunities to reduce spend. The Datalab environment also makes it possible to do advanced analytics. 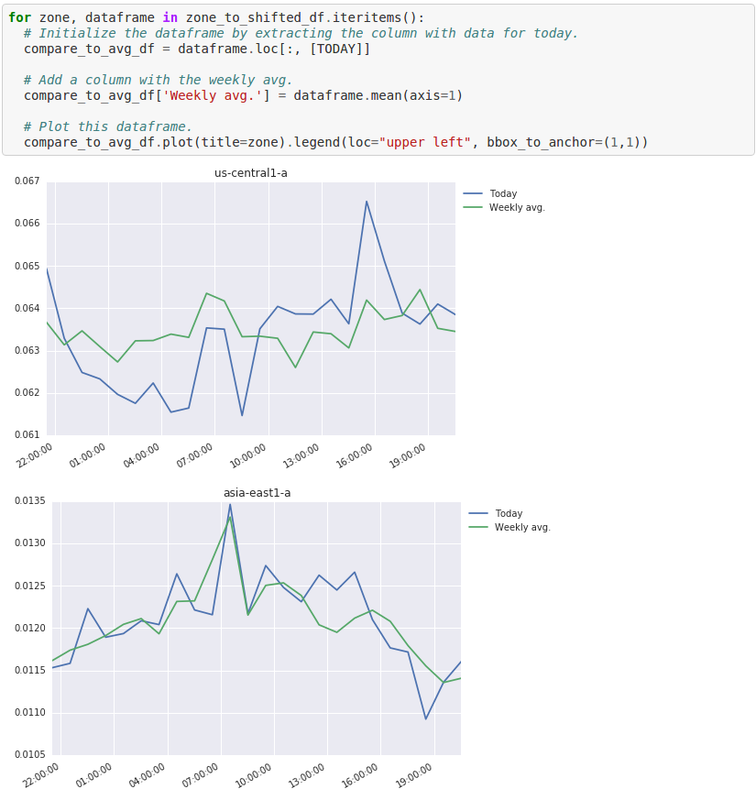 For example, in the included notebook, Time-shifted data.ipynb, we walk through time-shifting the data by day to compare today vs. historical data. This powerful analysis allows you to identify anomalies in your system metrics at a glance, by visualizing how they change from their historical values. The first step is to sign up for a 30-day free trial of Stackdriver Premium, which can monitor workloads on GCP and AWS. It takes two minutes to set up. Next, set up Cloud Datalab, which can be easily configured to run on Docker with this Quickstart. 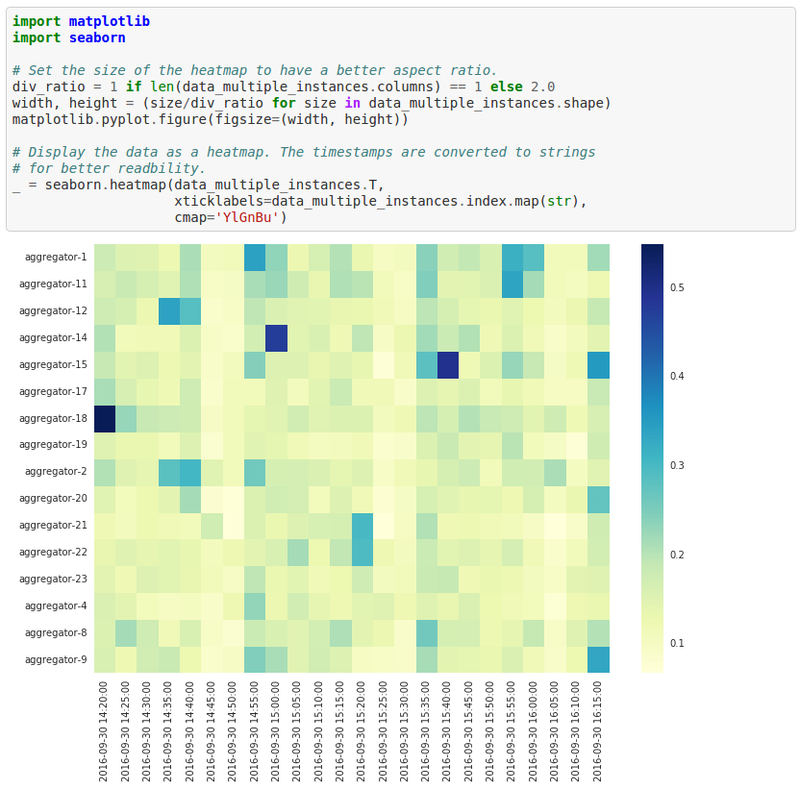 Sample code and notebooks for exploring trends in your data, analyzing group performance and heat map visualizations are included in the Datalab container. Let us know what you think, and we’ll do our best to address your feedback and make analysis of your monitoring data even simpler for you.